This was my favorite dip when I moved to America. I looked forward to visiting my friend, Becky, to watch the Super Bowl with my family because she made THE BEST buffalo chicken dip EVER. 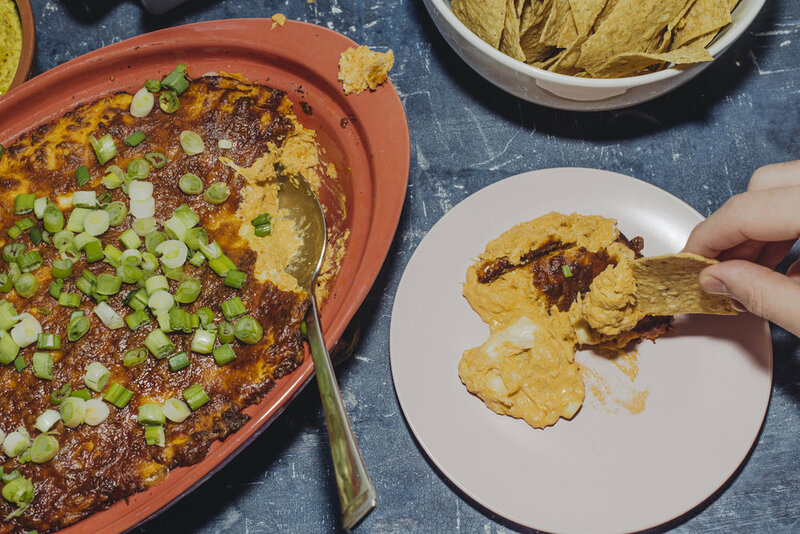 After so many years passed since then, I still remember Becky’s famous buffalo chicken dip around the Super Bowl season. It’s creamy, tangy, and just SUPER ADDICTIVE. It’s still one of my favorite things to eat no matter what season it is. If you want to have a healthy twist on this delicious dip, feel free to swap sour cream with greek yogurt. It will still be as pleasant as this one without the guilt, but I will have my steaming hot buffalo chicken dip, watching this year’s Super Bowl! Whisk cream cheese and sour cream until it’s smooth. Combine the cream mixture with shredded rotisserie chicken. Pour buffalo sauce and mix everything together until it all comes together. Transfer the mixture to a greased casserole dish. Top it with shredded cheese. Bake it in the oven for 30 minutes, or until the cheese layer gets dark and crispy. Once it’s done baking, garnish it with scallion. Serve it with chips, or crudités. Enjoy!